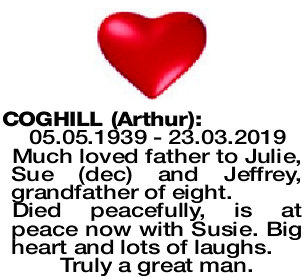 05.05.1939 - 23.03.2019 Much loved father to Julie, Sue (dec) and Jeffrey, grandfather of eight. Died peacefully, is at peace now with Susie. Big heart and lots of laughs. 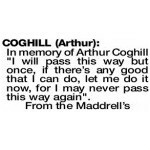 The Funeral Cortege for Mr Arthur Coghill of MERRIWA will arrive at the main entrance of PINNAROO Valley Memorial Park, Whitfords Avenue, Padbury at 10am on TUESDAY (2.04.2019) for a Cremation Service. "I will pass this way but once, if there's any good that I can do, let me do it now, for I may never pass this way again". Heartfelt sympathy to Julie, Norm, Jeffrey, Trudy, Sue (dec) and families on the sad loss of your dear Dad and Grandad. Happy memories of days gone by. 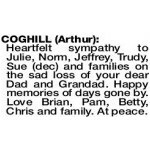 Love Brian, Pam, Betty, Chris and family. At peace. 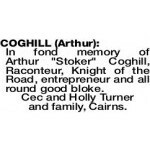 In fond memory of Arthur "Stoker" Coghill, Raconteur, Knight of the Road, entrepreneur and all round good bloke. Cec and Holly Turner and family, Cairns.